Twin Spin Deluxe is a slot machine that borrows heavily from the early days of casino gambling. The format is stripped back, and the title has a genuine feel of a classic 1960s Las Vegas slot machine. Despite its original visage, the Twin Spin Deluxe machine brings a completely fresh element to the tried and tested formula with its innovative take on gameboards and pay lines. 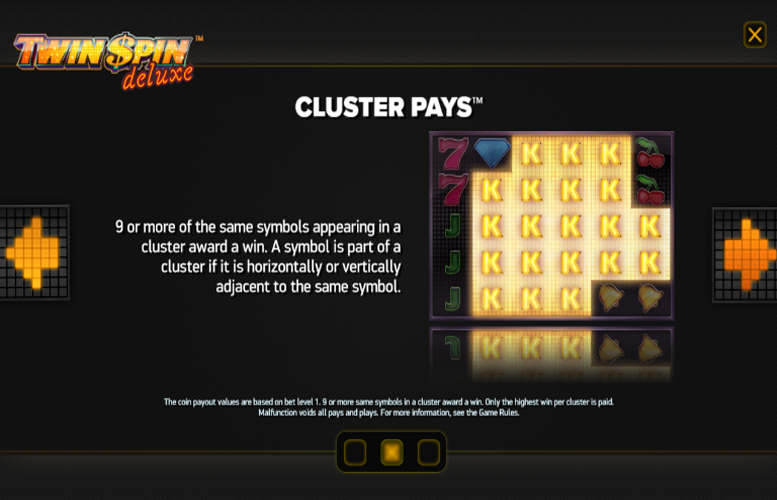 The payments are made when players match clusters of symbols, rather than linear win line pay-outs. Rather than paying out the maximum for a five-of-a-kind, the maximum here is technically 30-of-a-kind. This, along with a couple of neat special features brings the slot right into the 21st Century. Let’s take a closer look. Classic meets modern appeal. 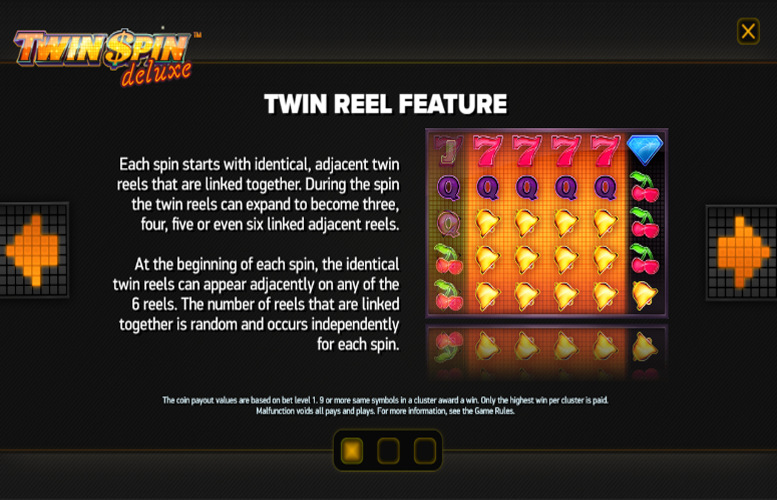 Twin Spin Deluxe brings original gambling imagery and features into the 21st Century with some innovative features. Simplistic gameplay. Players aren’t required to study the rules extensively before playing, it’s very intuitive. This will surely appeal to a certain niche of iGamers. Players used to multiple bonus features and flashy animation are likely to find Twin Spin Deluxe somewhat boring. 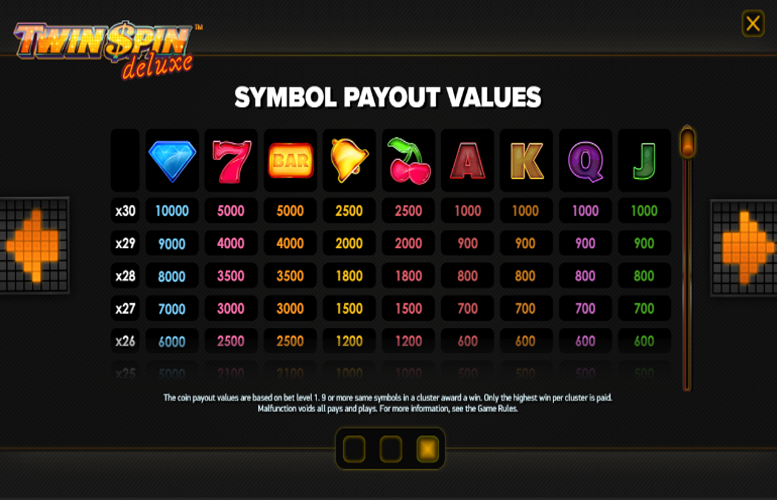 Thanks to Twin Spin Deluxe’s innovative game board and payment cluster format, the top jackpots are awarded for matching 30 of the highest value symbols. This means that every position on the board is filled with the same symbol. The symbols themselves have been taken straight from the world of classic casino gaming. There’s a diamond, lucky seven, bar, liberty bell, and cherries. Lucky Seven, or Bar = 5,000x coins. Liberty Bell or Cherries = 2,500x coins. Each spin starts with identical, adjacent twin reels that are linked together. During the spin, the twin reels can expand to become three, four, five, or even six linked adjacent reels. At the beginning of each spin, the identical twin reels can appear adjacently on any of the six reels. The number of reels that are linked together is random and occurs independently for each spin. Nine of more of the same symbols appearing in a cluster will award a win. A symbol is part of a cluster if it is horizontally or vertically adjacent to the same symbol. As is the case with the higher value symbols, the highest pay out using the regular ones is a cluster of 30. As is common on modern, online slot machines, these have been selected from the upper end of a standard deck of playing cards (A, K, Q, J, 10). The prize for hitting 30 of any of them is 1,000x coins. Despite there being no actual win lines on the Twin Spin Deluxe slot machine, the game plays like there are 10 fixed ones. 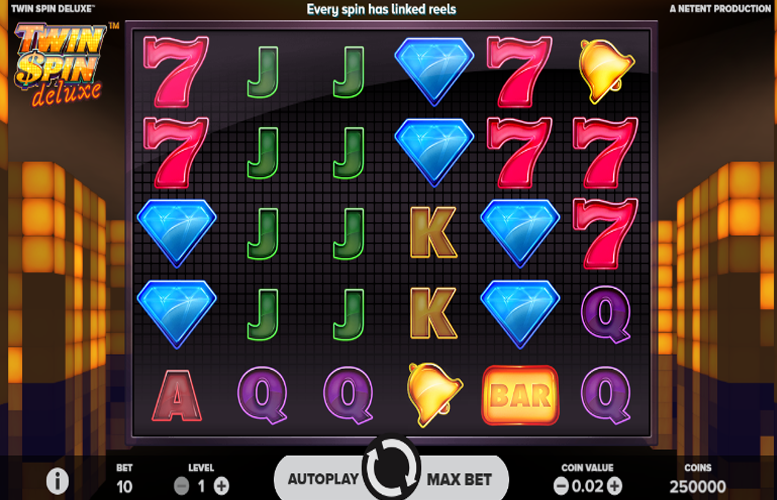 Players can bet between one and ten coins on these supposed win lines and each of these can be valued at one of the various integers listed on the slot (between 1p and £1). This means that with everything set to the maximum, the highest possible bet per spin is £200. Meanwhile, with all variables set to the lowest, the smallest bet per spin will be just 20p. We’re not usually that fond of slots that borrow too heavily from classic casino imagery. Many try to modernise the old-school machines and fail miserably in the process. However, Twin Spin Deluxe is different. It successfully manages to deliver a simplistic game that doesn’t need to rely on flashy features or animation to guarantee a quality iGaming experience. It’s genuine fun without the frills of many modern machines. We’re definite fans. Oh, and it has one of Netent’s typically large return to player ratings. This makes Twin Spin Deluxe ideal for wagering through a casino bonus on.